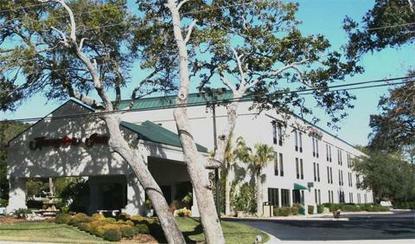 The Hampton Inn Amelia Island at Fernandina Beach hotel is located on the beautiful and historic barrier island of Amelia. Walk to the beach or checkout Historic Downtown Fernandina Beach with its Victorian village, harbor, shopping and dining sites. With two world-class resorts located nearby, you can now enjoy their amazing Spa Retreat Services. Our newly renovated hotel offers fresh and clean rooms that feature a microwave, small refrigerator, coffee/coffee maker, hair dryer, complimentary in-room movie channels, and high-speed wireless Internet. We also offer a complimentary On the House breakfast with over 20 hot and cold items served from 6-10 a.m. everyday.The Hampton Inn Amelia Island at Fernandina Beach hotel guestrooms have either one king-size bed or two queen-size beds featuring Hilton's Cloud Nine luxury pillow-top bedding system. This fluffy, all white bedding is perfect for a great night's sleep.Don't miss our fabulous, freshly baked cookies, served warm every evening. We are also pleased to offer our guests the use of beach equipment such as beach chairs, umbrellas, and towels, at no additional fee, while supplies last.We love having you here at the Hampton Inn Amelia Island at Fernandina Beach hotel in Florida.